Floating is the newest health and pain management concept in the world! 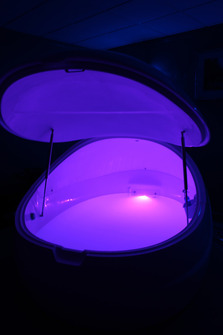 Float therapy works wonders for relaxation and recovery from the rigors of modern life, provides relief from chronic pain, boosts creativity, and leaves you with a euphoric afterglow that can last for days. We invite you to come visit us here at Crystal Water Float Spa, 40 W. Vine St., Tooele, UT for the ultimate experience of relaxation and rejuvenation! Buy one float for $50 and get your second float half off. That's $75 for two floats! We also offer Traditional Chinese Fire Cupping and have a master esthetician in-house. Please feel free to visit our website at www.crystalwaterfloat.com or give us a call 435-882-1339 for more information. We look forward to hearing from you!